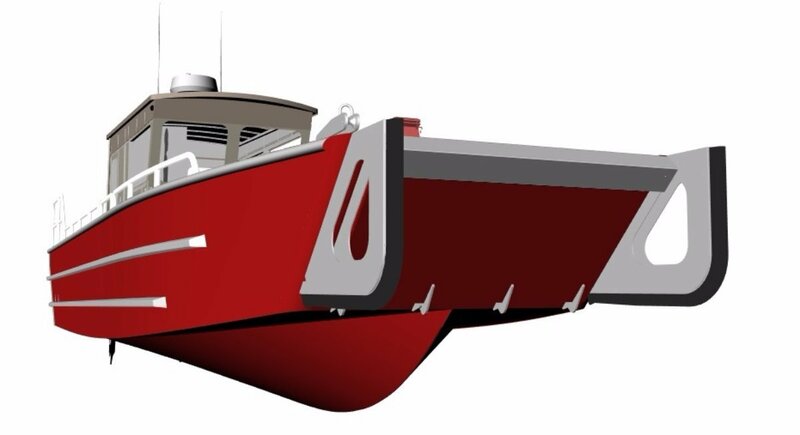 This Landing Craft has been designed for serious work in demanding conditions. Class / Survey: RINA / BV. CE Category: B / C. Passengers: 10. Crew: 2. Deadweight: 2900 Kg. Service speed @ standard power: 18 knots. 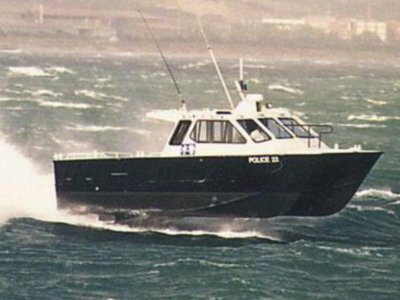 Max speed @ standard power: 22 knots. Main Engines: single 250hp diesel or twin 140 hp diesels. 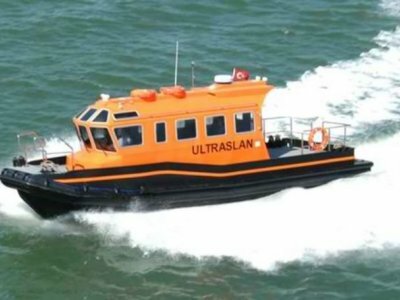 The structure is of marine grade aluminium All materials have RINa / DNV certification. While the hull's dimensions and structure are standard, many other features of the boat can be configured as per owner's requirements. 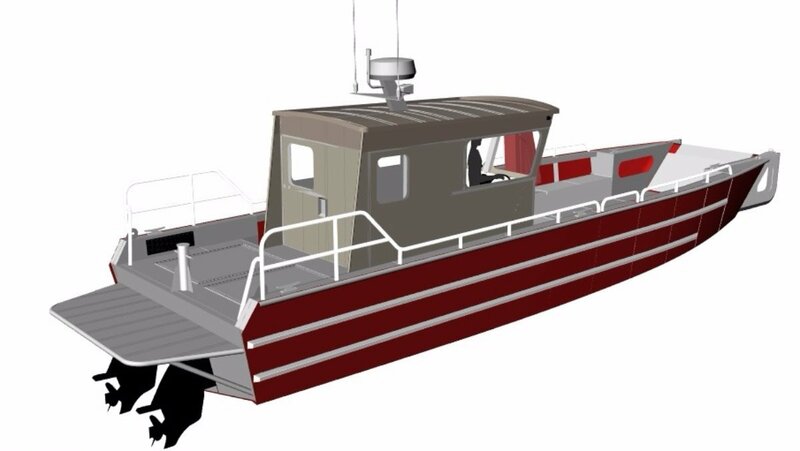 This includes deck layout, wheelhouse dimensions, engine type and power, tankage and deck equipment. The standard layout includes several high capacity storage options : 2 forward seat lockers with waterproof lids, 1 cabin seat locker and 2 dive bottles lockers (with a capacity of 6 50 lt. Bottles). 2 side doors (700 mm. Wide) are located aft of the forward seats. They can be of the "flip down" or "lift out" type or hinged. 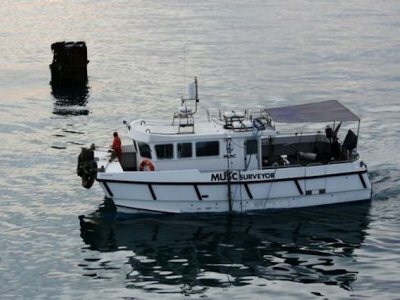 The boat can be equipped with a small crane installed on a reinforced base. Push-knees (optional) are designed and built as per owner requirements to address specific work conditions. The standard walkaround wheelhouse is large and comfortable. It is designed to offer good protection to two or three crew members even in bad weather conditions for long work periods. Propulsion & Performance Main Engines: Can be single 250hp or 2 x 140hp inboard diesel engines Outboard motors can also be specified Power Standard power is inboard diesel engines (single or twin) with sterndrives. Large flush hatches give easy access to the engine room. There is room for a 5.6 kW generator, 4 high capacity batteries and two 47 lt. Sullage tanks. Outboard version The boat can be powered by one or two gasoline outboard engines, either on a bracket or transom mounted. 1 electrical emergency pump in bilge, manual start. 1 electrical emergency pump in engine room, manual start. All electrical wiring in marine cable. Shore power with control lamp, marked fuses, earth connection and 20 m shore cable. Isolation transformer with earth plate for protection of galvanic corrosion. Main switches with separate battery systems for start, navigation and consumption. 1 searchlight on cabin roof, manual operated. Complete engine instruments with RPM, temperature, oil pressure and voltmeter. Control panel for all lighting and other electrical equipment. The structure is of marine grade aluminium : plates of 5083 H116/H321, extrusions of 6061-T6 and weld wire 5183. All materials have RINa / DNV certification. Transverse frames and bulkheads are of 6 mm. Thick plate, spaced 800 mm. Longitudinals are extrusions of several types and thickness on 267 mm. Centers. Shell thicknesses are 5 mm. (sides) and 6 mm. (bottom). A 6 mm. Beach plate adds extra strenght to the center part of the bottom. The deck is 5 mm. Thick on closely spaced deck stringers. The structure is reinforced all around the large hatches that give full access to the engines and forward lockers. Gunwale, seats and crane foundation complete the hull structure. Lifting eys are welded to the structure and are designed to lift the boat in full load condition. While the hull's dimensions and structure are standard, many other features of the boat can be configured as per owner's requirements. 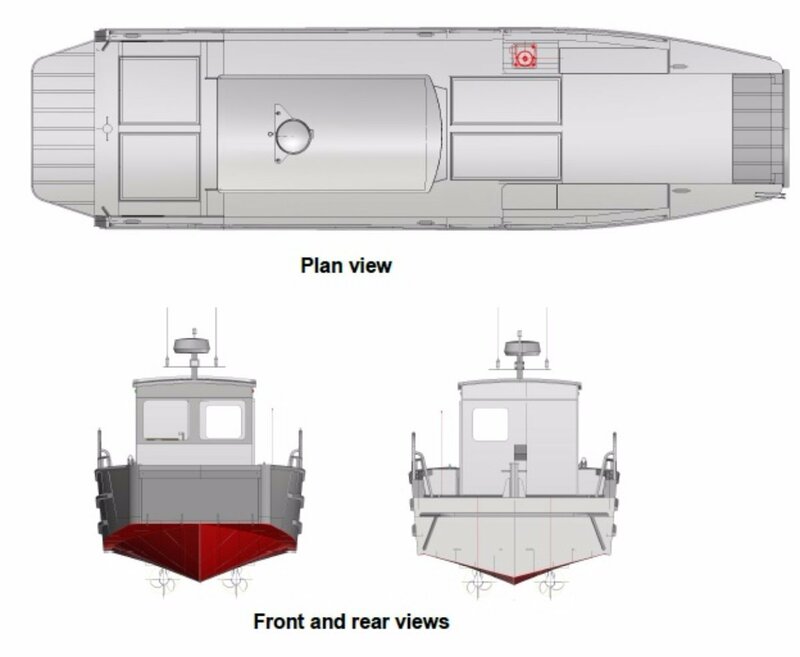 This includes deck layout, wheelhouse dimensions, engine type and power, tankage and deck equipment. The standard layout includes several high capacity storage options : 2 forward seat lockers with waterproof lids, 1 cabin seat locker and 2 dive bottles lockers (with a capacity of 6 50 lt. Bottles). 2 side doors (700 mm. Wide) are located aft of the forward seats. They can be of the "flip down" or "lift out" type or hinged. The boat can be equipped with a small crane installed on a reinforced base. Push-knees (optional) are designed and built as per owner requirements to address specific work conditions. The heavy duty bow door is 1.7 mt. Wide. The opening system can be manual (winch) or hydraulic. The aft deck, 1.8 mt. Long x 2.8 mt. Wide, is a safe working area. Stern platform to owner's specifications. protection to two or three crew members even in bad weather conditions for long work periods. Access is through a sliding door and it has room for two pilot seats and a professional dive panel. The toilet compartment is small (1100 mm. X 700 mm. ) but can be outfitted with WC, a small sink a shower-head. Access can be from the cabin or exterior from the side deck. 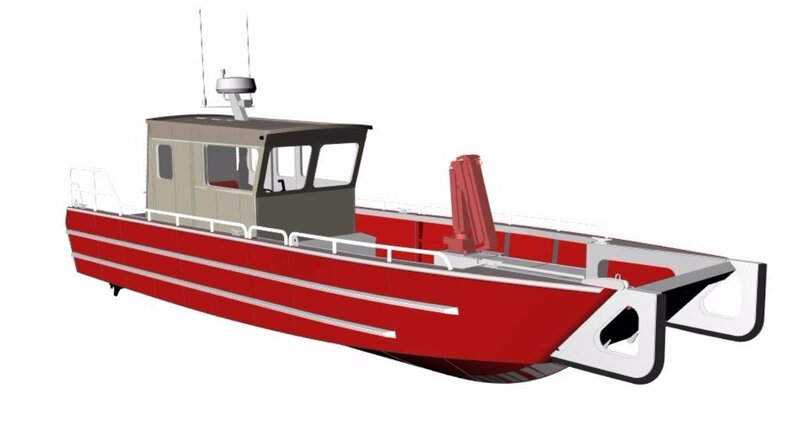 Pilothouse characteristics, dimensions and placement are totally customizable. 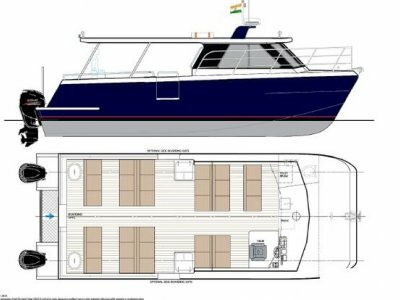 Options include a smaller walkaround type center console with a T-Top, an offset wheelhouse with passage only in one side or a large full width walk-thru pilothouse.